In the devastating diss track “The Story of Adidon” released back in May, Pusha-T accused Drake of hiding a secret son, a child allegedly named Adonis, who he claimed the Canadian rapper was about to reveal to the world as a part of an Adidas collaboration. On his brand-new double album Scorpion, which dropped late Thursday night, Drake raps about trying to protect his son from internet rumors, single parenting, and finding out he was going to be a dad despite only meeting up with his child’s mother “two times.” All of which is to say, if Drake doesn’t have a kid, this is one hell of a concept album. 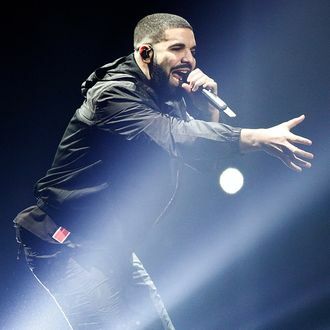 On “March 14,” Drake also reveals his son’s birthday (October 11, a number the rapper got tattooed in the boy’s honor) and what seem to be custody issues with his child’s mother. “I got a empty crib in my empty crib / I only met you one time, introduced you to Saint Nick / He must’ve brought you like 20 gifts / Your mother saying you growing so fast that they don’t really fit but, man, you know / I still had to get it for my boy tho.” Raps Drake, “Sorry, I’m venting trying to cover ground / They said in two weeks you’re supposed to come to town / Hopefully by the time you hear this, your mother and I will have come around instead of always cutting each other down / God willing / I got a good feeling.” You can stream the entire album on Apple Music now.